The Netflix model of paying a low monthly subscription to have access to a copious amount of videos is prompting other companies to adapt the business model in other sectors. 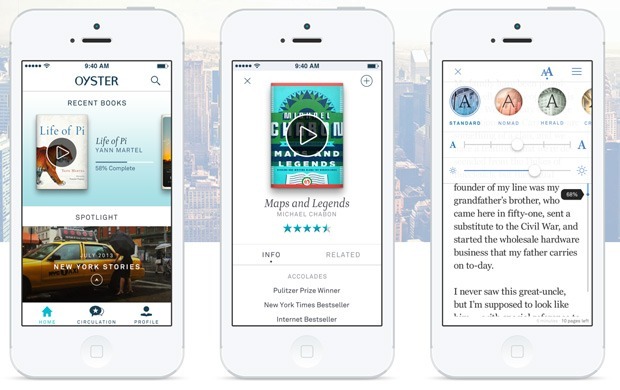 Startup Oyster currently serves over 100,000 eBooks and investors are feeling bullish about the future of reading. Today, it was announced that Highland Capital Partners and Peter Thiel’s Founders Fund sunk 14 million dollars into the enterprise. Oyster is using the cash to embark on a new expansion effort into new markets and will develop a new Android app. The start-up opened for business in September with an iPhone app, then added an iPad app the next month, nearly doubling its subscriber count. Oyster is not only trying to convince investors they are on to something but big publishers are jumping onboard. HarperCollins and Houghton Mifflin, as well as smaller ones like Workman Publishing, Smashwords and Perseus have committed thousands of titles.